there was this scene in "public enemies" that i shouldn't cry, u shouldn't cry too, but i cried ter-esak-esak-ly. i dont think anybody else cried at that scene. that was the part when billie Frechette (jonidep's gf) was being beaten and slapped when she was being investigated in the police station, about john dillinger (jonidep)'s wherabout. that is soo not a "sad" scene at all. maybe i was being too carried away with billie's character, i was imagining myself in her shoes. the feeling of waiting to be beaten. perasaan yg sgt gundah and scared and feeling so small and so fragile and deeply sad. rasa sgt berdebar2 dan takut dan menggeletar dan menangis dan semualah at the same time. perasaan semasa anda kena pukul and yet, u cant defend yourself, or atlis slapped back. u just dont have the guts. i gave billie 10stars for that scene alone. there are several reasons why i think i should like this movie. one, the hero ialah jonidep. siapakah yg tidak chentakan jonidep, kan? two, it was based on a true story. John Dillinger (jonidep) is one of America's most notorious gangster. i cant deny true story. true story rocks, big time. 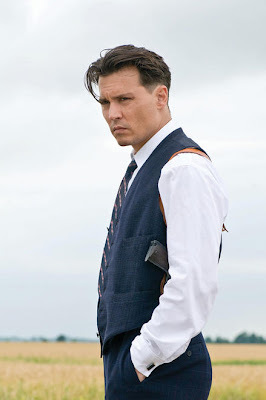 three, u should watch how jonidep performed as john dillinger. he really stands out in his own charisma & confidence. such same strong character when he played as donnie brasco last time.